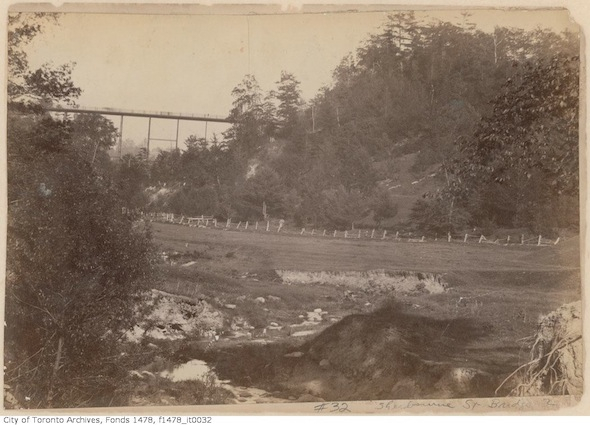 You can't write about Garrison Creek and Taddle Creek and other lost Toronto rivers without mentioning Castle Frank Brook, a river responsible for carving out several of the city's most famous ravines on its winding southeasterly course from north of Eglinton Avenue to its confluence with the Don River near the Prince Edward Viaduct. Like many rivers, Castle Frank Brook can be traced to several minor tributaries that radiate out like cracks in a windshield north of Eglinton. The best (and simplest) way to track the old course is to pick up the river where it began to increase in size in Cedarvale Park at its confluence with Cedarvale Stream. 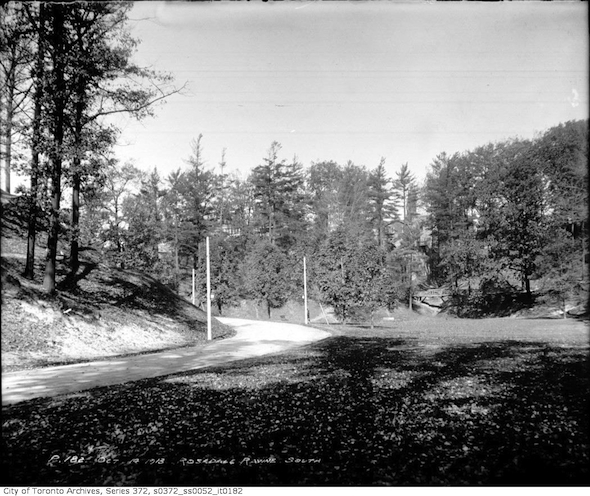 Castle Frank Brook entered Cedarvale Park roughly where Phil White Arena is located today. Flowing east, it merged with Cedarvale Stream, the river responsible for the valley extending northwest to Ava Road, before the Glen Cedar Bridge (shown above). 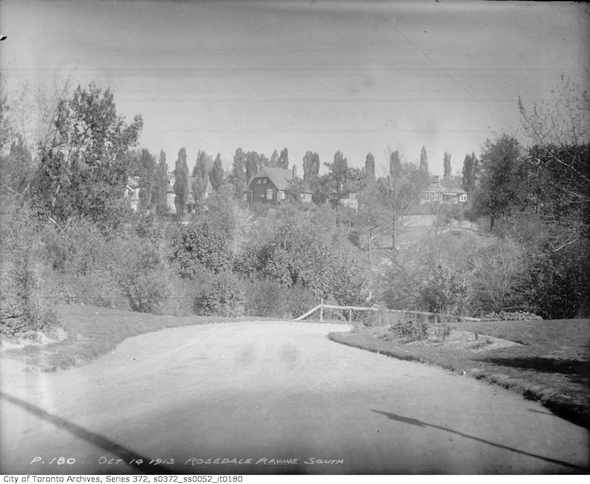 Cedarvale has an interesting history: once considered prime mansion real estate by the city's rich and famous, the great depression scuppered any serious plans to develop the area. Ernest Hemingway was apparently a frequent visitor to the park during his years at the Toronto Star, before the area was threatened in the 60s and 70s by the Spadina Expressway - a controversial, unbuilt highway that would have sliced through the ravine to meet (and ruin) Spadina Road. Allen Road is the only section of the expressway ever constructed - its terminus at Eglinton Avenue points ominously toward the path it would have taken through the city had 11th hour protests not been successful in cancelling the project. Today, the Spadina subway line rumbles beneath the grass. From here, Castle Frank Brook winds uncovered through much of Cedarvale Park until it disappears back underground beneath St. Clair West station. Just before this brief foray into the depths, the stream once met with Forest Hill Stream, another minor tributary that carved out the ravine at Relmar Gardens. Once beneath the subway station, the brook re-emerges, uncovered, in Nordheimer Ravine, a green space divided up as Sir Winston Churchill and Roycroft Parks. This peaceful area saw tragedy during the deadly 1995 Russell Hill subway disaster when around 6pm on August 11, 1995, two packed trains collided between St. Clair West and Dupont stations, killing three and hospitalising thirty more. An emergency entrance into the subway tunnel in the ravine was pressed into use to rescue the injured. Disappearing underground for the last time at the southeast corner of the Nordheimer Ravine, Castle Frank Brook heads south to the old Lake Iroquois shoreline at Davenport Road, necessitating today's snaking sections of Boulton and Glen Edyth Drives. 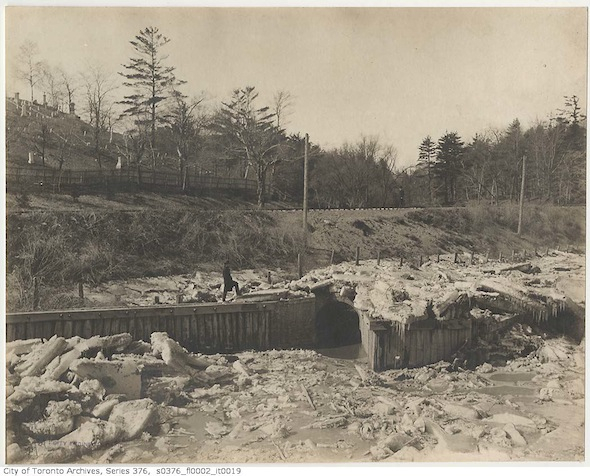 Sewers then channel the river beneath Dupont Street and Avenue Road to Ramsden Park. According to Lost Rivers, the brilliant site from which much of this information is sourced, the landscape of Ramsden Park was heavily effected by the Yorkville Brick Yards that once stood on the site and produced the distinctive yellow-white brick used in Yorkville Town Hall, St. Lawrence Hall and University College, among others. The image above shows the landscape once found in the area of Roxborough Street. Heading east out of Ramsden Park, Castle Frank Brook passed under Yonge Street and beside Severn's Brewery, a beer and whiskey producing facility owned by John Severn, a local councillor. Severn didn't opt to use the river water passing by his property and instead had it pimped in from Summerhill. From there, the river flowed into, or rather created, the Rosedale Ravine. Between Mount Pleasant Road and Sherbourne Street the water, nearly at its exit, passed another brewery owned by Joseph Bloore, the namesake of Bloor Street (no-one knows where the 'e' went) and founder of Yorkville. A small dam beside the property used to generate water power created a pond popular with skaters in winter. 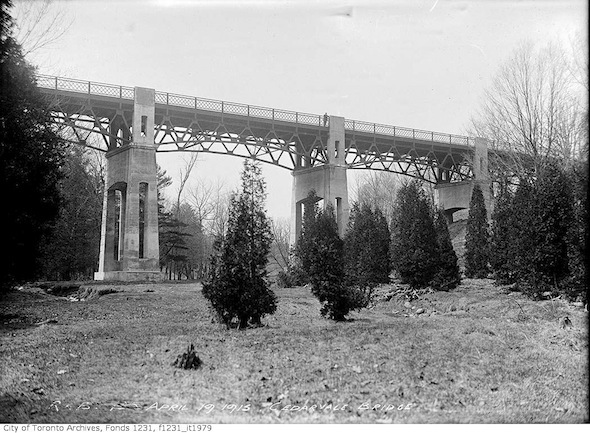 The final stretch of Castle Frank Brook followed Rosedale Ravine beneath the subway and western arm of the Prince Edward Viaduct. 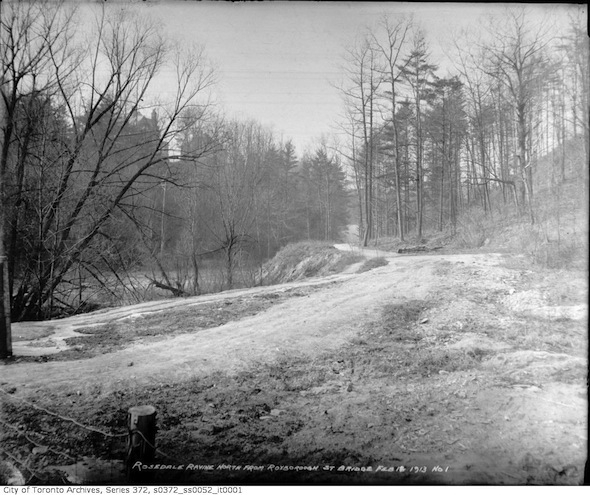 Before the river emptied into the Don River roughly where Rosedale Valley Road intersects with Bayview Avenue, it once passed Castle Frank - a summer home of the Simcoe family that gives the stream and subway station its name. The small wooden structure was named for the son of John Graves Simcoe, Francis. Today, like Garrison and Taddle Creeks, much of Castle Frank Brook's course is contained by sewers. Unlike those other rivers, this stream had a much more pronounced effect on the landscape of Toronto. Without rivers like this one we wouldn't have the plunging ravine system we are all able to enjoy today. 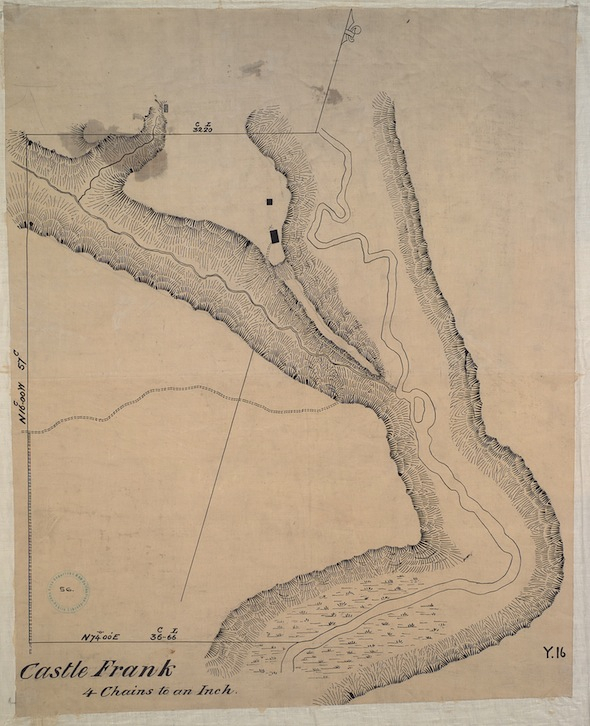 A 1784 map showing the confluence of Castle Frank Brook and the Don River. The black square represents Castle Frank. Looking over the crest of the Rosedale Ravine. Floor of the Rosedale Valley. 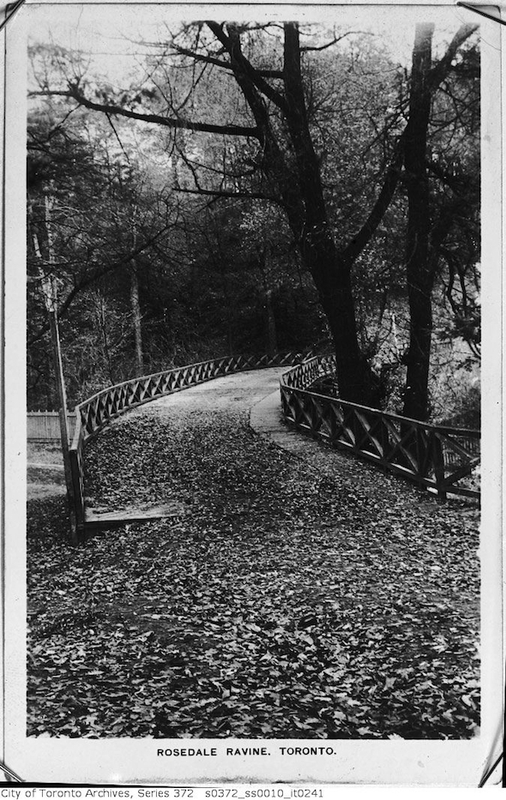 Old bridge over Rosedale Valley at Parliament Street. All images from the City of Toronto Archives except the 1784 map of Castle Frank Brook and Don River, which is from Wikipedia and used under Wikimedia Commons.